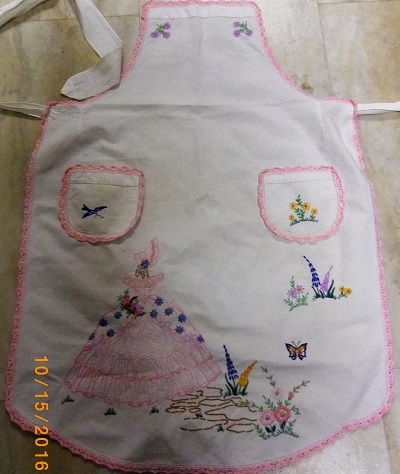 Patra's Embroidered Aprons: Crinoline Lady apron rescued! It has been a long long time since I bought a vintage embroidered apron - at least a year ago. One of the ladies at our Quilt Shop stitch and sew group on Friday, showed me this apron that she had bought from someone else for $5. The person she got it from said she'd bought a few of them on eBay for $5, which I found hard to believe, as something like this would normally fetch above $30. I asked her what she was going to do with it and she said she would probably cut it up and use it in craft projects. The look of horror on my face must have been comical, or she was expecting it, because she laughed. I offered to buy it from her and she said how much would you pay? I rashly said $50 and she said immediately it's a deal. But when I got my purse out, I only had $40 so I thought about it some more, and went across to her and said "no, I'm being stupid. I used to pay that years ago when I was building my collection, but I need to be realistic these days about spending that amount of money on my linen collection. So go ahead and cut it up". She asked if I'd pay $40 for it, and I should have said no, but honestly, I haven't seen an apron so beautifully stitched for a long time, and reluctantly decided I had to have it. Had to go to the bank and withdraw some cash to keep me going, but everytime I look at this I think it was worth it!